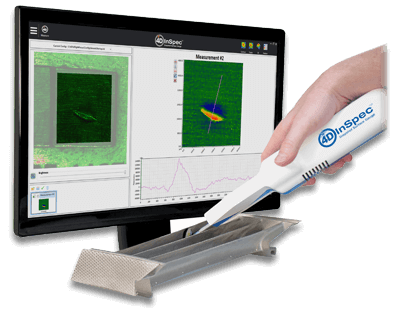 The 4D InSpec Surface Gauge is the first handheld, precision instrument for non-contact measurement of surface features and defects. With micrometer-level resolution, portability, affordability and ease-of-use, the 4D InSpec puts high resolution measurement on the factory floor, in machine shops and in field service applications. The 4D InSpec brings high resolution, 3D surface measurement to the factory floor. Measure pits, scratches, nicks, dents, bumps, rivet depth, dot peen depth, etc., from 0.1 to 100 mils deep. Unlike high-end metrology systems it is rugged, flexible and affordable, to measure features on a wide range of part geometries, in the most challenging environments.